You may have heard a lot of hype about how Scottsdale, Arizona, is a fantastic destination for golfers from all over the world to come test the world class golf courses that lie in the desert. 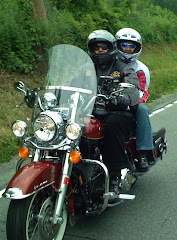 The weather is terrific and the breathtaking landscapes offer a "WOW" factor. Many of the golf courses in Arizona feature that desert-style environment which can make a round of golf challenging due to the forced carries off the tee boxes and fairways - but don’t fooled by it - there are many golf courses in the State that cater to the average golfer as well, featuring wide fairways and more links style golf. 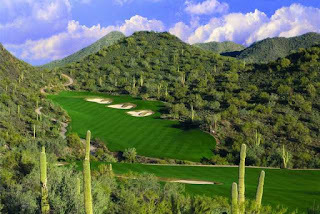 Phoenix and Scottsdale are two destinations which cater to all level of golfer from intermediate to experienced. Below is a list of the top 10 golf courses in Scottsdale that are great for the beginning golfer to play while on an Arizona Golf Vacation. These courses below are very playable for the average golfer and are recommended based on their quality and scenery. 1. Legend At Arrowhead Golf Club: an award-winning Arnold Palmer-designed championship golf course. 2. Superstition Springs Golf Club: Regional qualifying site for PGA Tour events, so you know it is in pristine shape! 3. McCormick Ranch Golf Club: Water in the desert? Palm trees and mountain vistas too! 4. StoneCreek Golf Club: Recognized by Golf Channel as one of Arizona's "Best Kept Secrets." 5. Wigwam Golf Club: Three Memorable Courses to Choose! 6. 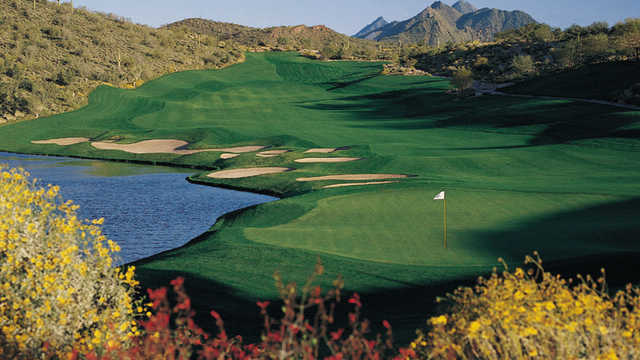 Arizona Biltmore Golf Club: Two courses with a choice of traditional or links-style Golf. 7. Camelback – Padre Course: A traditional-style course with awesome views of Camelback Mountain. 8. Orange Tree Golf Course: Once an orange grove, now a desert oasis, this course is recognized as "green" with great Camelback Mountain views. 9. Starfire Golf Club: Formerly Scottsdale Country Club, this is a 27-hole Arnold Palmer designed facility. 10. Grand Canyon University Golf Course: A muni-golf course with state-of-the-art amenities. Think we need to add a few more golf courses to this list? Use the comments section of this golf blog to state your case! Do you draw a line on your golf ball and use it to point to where you want your ball to roll on the green? If so, you could be diminishing your chances to hole out. 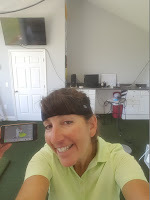 During a recent lesson with my PGA instructor, Dale Ketola, at the Grande Dunes Golf Performance Center, the focus was on putting and the mental game. Dale made me realize that I don't need the line which I currently place on my ball to point to the target - the line, speed, confidence, and feel are all in my head. Dale incorporates really high line golf technology into his lessons to show where players need improvement or if they are on the right track. Along with V1 software, BODITRAK and Flightscope, my very able instructor utilizes FocusBand with his students. 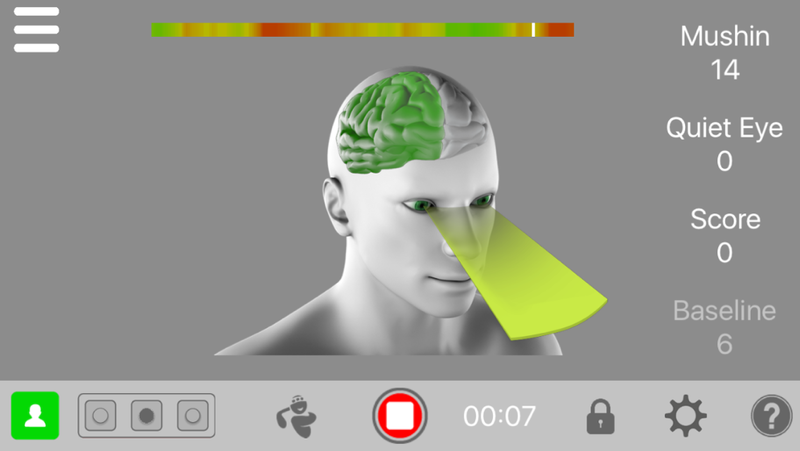 FocusBand is a mind-sensing neurofeedback device which shows when a golfer is thinking too much negative thoughts when playing the game. Sounds like it comes from the head of Gene Roddenberry, doesn't it? Several well known PGA Tour, LPGA and Web.com Tour players, such as Jason Day and Michelle Wie, use this apparatus...and now it is my turn to try it out! Dale dropped a ball on the green (as if it landed in that perfect position) and watched as I performed my pre-shot routine. The simple interface showed that, while standing over the ball ready to putt, my brain was "in the red zone". Uh, oh,...I was definitely thinking too much! But, what was I thinking of? That was for my instructor to determine as machines cannot give you that piece of the puzzle...yet. It is his experience as a teacher and player that made me understand what I am thinking, sensing and how to limit my thoughts to one visual before striking the ball. I asked Dale what he does during his pre-shot putting routine. He says that, before taking his putt, he analyzes the green, then stares at the dirt in the bottom of the cup and puts that thought of the circle into his mind; he goes up to the marker, places his ball (with a small circle drawn on top) into position, aims and shoots. 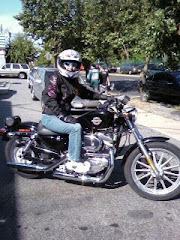 At address, I need to, "Occupy my mind with what's going to happen, not how it's going to happen." You can also relate putting to driving a car and how you don't consciously think of pressing down on gas or brake pedal or placing your hands on the steering wheel or turning your car to the left or right - you just know how to do it already and make it happen. I learned quite a bit during my putting lesson at the Golf Performance Center - thank you, Dale! Now, I need to practice my new routine so that, when I get onto the course, my brain is in the "green zone" on the green! After his sobering loss at the 99th PGA Championship, David Duval said of Hideki Matsuyama, "On a Sunday, I don't think you have to make a ton of 15-footers, but you have to make the four and five footers to win a golf tournament." What techniques do you use to "see" the ball to the hole? Let's talk putting! Post comments below on this golf blog and on Twitter @Golf4Beginners. 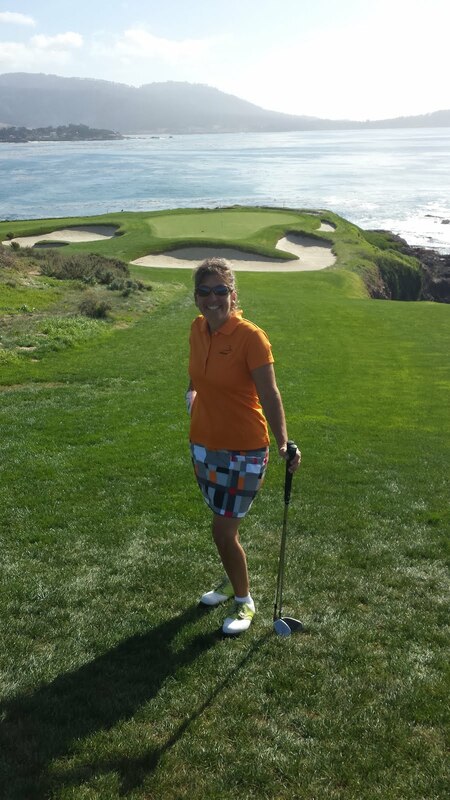 Bermuda Sands Apparel for Women - Fit for #Golf! Golf apparel, once only designed for style, has blossomed into functional wear which works well both on and off the course. Fit, fashion, and comfort are just as important during an eighteen hole stretch as they are at the 19th while having a snack with your foursome. So, what makes certain golf apparel perennial favorites? Although certain styles are naturally de rigeur, like polos, cardigans, and khakis, brands are reaching out to millennials with more trendy pieces sporting bolder colors, changes in collar design and added functionality such as cell phone and scorecard pockets. Where a few fashion-forward items are meaningful to every wardrobe, comfort is probably the most important functional spec which determines what I wear for my round of golf. I usually reach for the same pieces over and over again and, when I add a new skort or shirt to my attire, it had better serve a purpose. I recently added to my closet a golf shirt and skort from Bermuda Sands Women's Fall Collection, "Evelina" Women's polo and the "Vera" skort from the Creston Peak Collection. Black and white complement any season and the bold lavender definitely stands out against the changing Autumn scenery. The medallion pattern on the skort carries onto all of the available tops which means if it gets chilly, I can add a cover-up to the outfit! 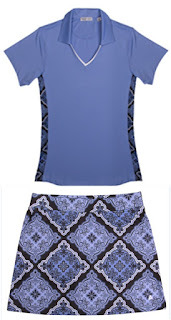 Yes, I will be a fashion statement on the golf course come this fall but that is not why I will be excited to wear my new Bermuda Sands outfit. The quality of the materials used is excellent. As I held both pieces, I couldn't help but notice the silky feel and weight of the fabric. I thought it would be heavy when I tried on the outfit but was impressed by its lightweight comfort. The Greer line of golf apparel is 92% Polyester and 8% Spandex stretch jersey, which offers a great range of motion and should also help to keep me comfortable and dry, even when I am sweating out those ten-footers for par. Bermuda Sands also offers a men's line of short and long sleeve shirts and outerwear. Bermuda Sands, an innovative golf apparel company, has been creating fine clothing for both men and women since 2009 and, since the quality of their clothing is first-rate, in my opinion, this company deserves a look. Do you love shopping for golf apparel? If so, are you partial to polos...skorts? 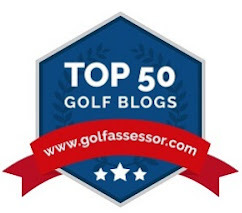 Feedback requested on our golf blog in the comments section and on Twitter @Golf4Beginners. I may receive free services, items or payment from miscellaneous providers of golf-related merchandise. ❀ I promise that I will always deliver my honest opinion! Do you consider yourself to be a strong putter or do you feel you could improve your make percentage on the green? Most amateurs could use help with the flat stick! Poor lag putting, missing on the low side, 3-putts, the yips...all are solvable. The art of putting comes down to two concepts, speed and alignment. If either one of them is off, your putt won't go in the hole...it's that simple. How do you sink more putts? Practice, practice, practice. You can try training aids if your visual skills or feel are off; Golf for Beginners has tried many types of training aids over the years and most of them are effective but you have to use them in order for them to help you gain positive results. This brings me to a training aid called The Delta Putt by Gsix Products. I received this putting trainer recently to test and will give you my honest opinion with regards to its functionality. 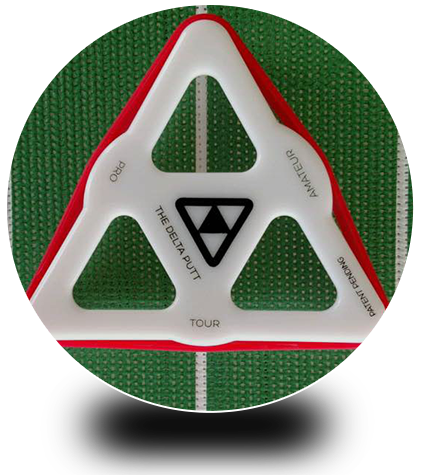 First, a product description.."
The Delta Putt comes with two components - a lined mat and a triangular "puck" with "amateur", "pro" and "tour" markings on the flat sides with a bump out near each of the markings. 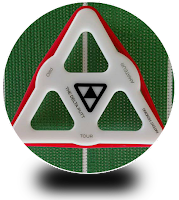 Place the triangular puck onto the mat with the "amateur" in line with your putter face and make a putt. The puck should slide straight on the mat and land on its intended target - the "hole" - a picture of the puck at the end of the mat. Any veering or spinning of the puck means you have not hit your putter face on its sweet spot (the toe was closed or open at impact). Don't move onto the next level, "PRO", until you have mastered the amateur side of the puck, which means straight down the intended line without spinning or veering left or right. As mentioned in the Delta Putt video instruction guide, "If you can make it to the "TOUR" level, "you have developed yourself into one really fine putter." Although Golf for Beginners does not endorse any one product, I can say that The Delta Putt has the ability to guide you to a better stroke if you use it. After a few putts, I noticed the Delta Putt "puck" began to move straight down the line. Yes, I did try it on the "PRO" and "TOUR" levels, and I quickly backed down to AMATEUR! The only way I can truly tell if this training aid works is to continue to use it and then to test my putting in a real-life scenario. Which training aids do you use to improve putting? Let us know in the comments section of this golf blog and on Twitter @Golf4Beginners.